Summary: Erected a huge tent over Ocelot that Golf had bought with our seed money. Workers used paint stripper to remove much of our bottom paint, and all deck hardware, including 19 hatches, were removed as the teak continued to be removed. More packing up of cushions, mattresses, etc, and several trips to Golf's workshop to store it all. Started stripping the mast and boom of all the steps, ropes and other fittings. We lowered Tomcat (our dinghy), flushed the engine, and took all it to the workshop. All fittings were removed from the cockpit, as well as the teak decks. The transoms were ground back and the woodworker started building a mold to extend the transoms. Today we dressed Ocelot up for Halloween! Well, and to keep the workers, and us, cool. A team of about 8 young Thai men arrived and assembled a huge frame over Ocelot. Then, like circus acrobats, they climbed the still rickety structure to bolt it together and pull up the huge white tent. Quite an event. Not a minute too soon, either, as the skies opened with a huge squall just as they were pulling the two flaps together. What was scary was watching a young guy up on TOP of the tent pulling the Velcro sections together. Can you say slippery? So now Ocelot is the queen of the boats, and no doubt the favorite place to be assigned to work. Yay for shade! Work continued on the deck: more hardware coming off, the netting on the lifelines removed, and they drilled off and removed the aluminum frame on the forward part of the deck which used to hide the join between the hull and deck. Lots of scraping to get off the old anti-fouling and grinding where we want to extend the sugar‑scoops. That's one job we are REALLY glad to not have to do. And we're also very happy to see the workers must wear protective breathing apparatus and eye shields and long sleeves and long pants. 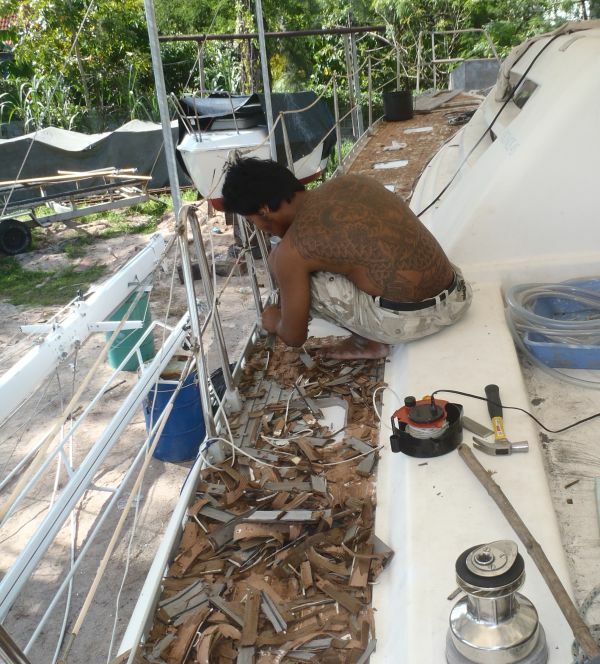 In contrast, our teak workers on deck are stripped to shorts, their tattoos rippling as they hammer and chisel off the old wood. Meng is doing a lot of the hardware removal -- pad eyes and cleats, and deck locker handles and hinges. We got the mattresses all bagged up and ready to take to Golf's workshop/storage. We are still amazed at all the STUFF that comes out of the boat. Like magicians pulling rabbits from a hat, we seem to be able to produce more and more boat stuff. Scary! Goes to show what awesome storage spaces we have on Ocelot, as the boat didn't FEEL crowded! The goal will be to NOT put all of it back on board! Steve and Gayla, from Ariel, drove by to pick us up. 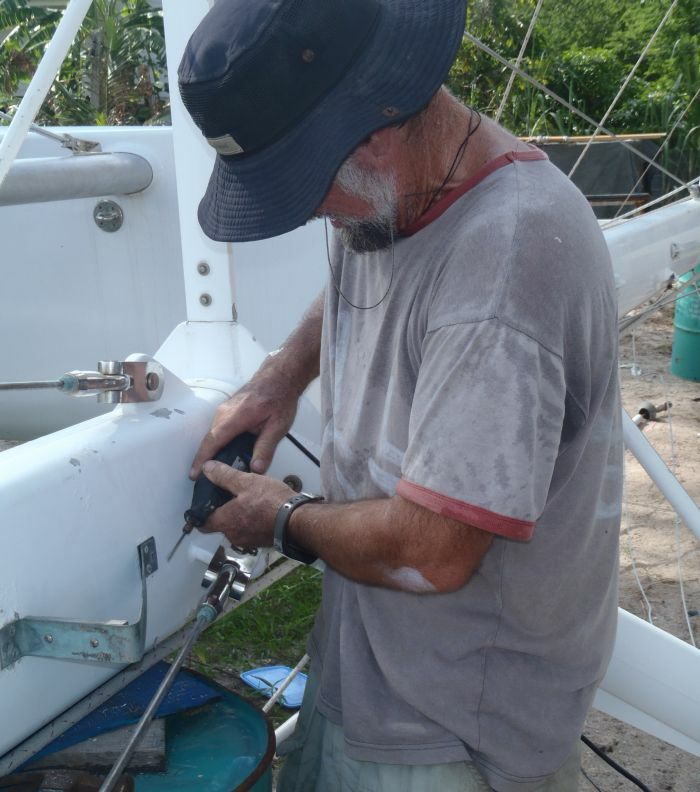 Steve is in a cast for a broken heel bone: he fell off the ladder on the side of Ariel while it was on the hard for a bottom paint job, but luckily he can still drive, and hobble about. We went to our mutually favorite restaurant, Anchor Inn, for dinner, then returned to our apartment to work on their website with them. Anyone want to buy their lovely and extremely well equipped 60' cruising boat? Clothes, shoes, spare shampoos. Bottles of cleaning chemicals, sandpaper, tools, games, linens, food (though we tried to eat it all up! ), pots and pans, dinghy parts, engine parts and spares, computer bits and pieces and DVD's and CD's and cables. Camera gear and diving gear and watermaker parts. Oh, and don't forget the books and paper (yes, we still carry paper) charts! Found the big ripped green spinnaker that we got for a work swap in Chagos and have carried ever since: we decided to ditch the sail part and keep the sock in case we find a better fitting one! Endless endless endless. We took off another 3 boxes (makes it over 20 now!) and all 8 mattresses removed to storage. Golf's workspace is getting filled up with our crappola. On the teak front, all 12 of our small hatches are off and the spaces filled with a stiff plastic insert to keep the mess outside as much as possible. We have to get better at opening and closing these deck hatches more often when we're all put back together -- use it or lose it. We had lost flexibility in several of the gaskets and hinges. 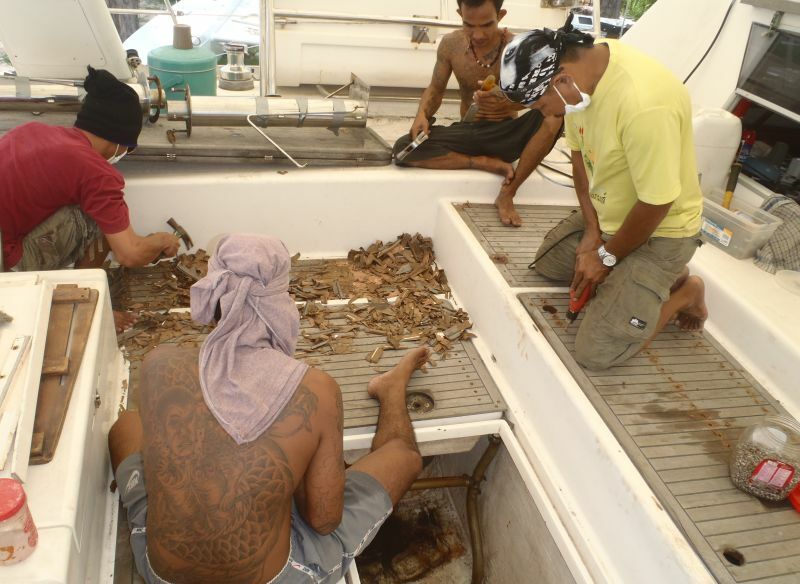 The workers pulled off the 2 anchor locker hatches up forward and started removing the teak. Ocelot has become the company's workspace, with cabinet and tables built under our hulls. Oh oh. Looks too terribly permanent sometimes. Will they ever get us finished? 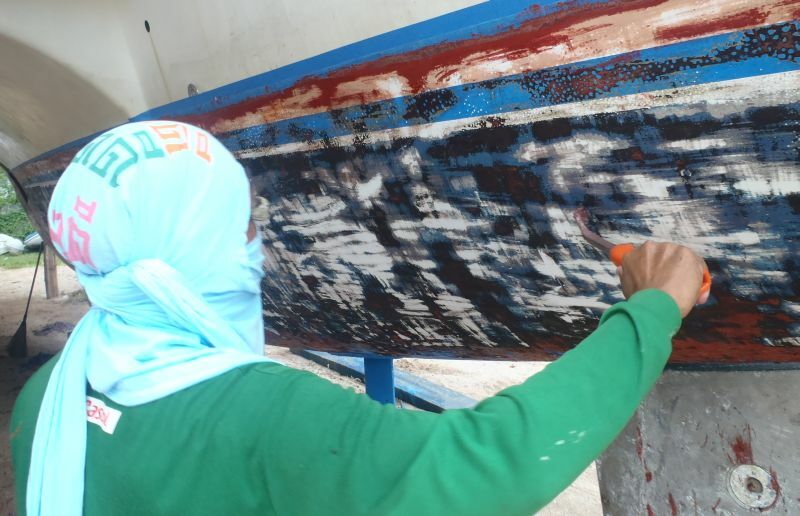 There was lots more hull scraping going on, and hull grinding (so glad NOT to be doing THAT!) on the starboard transom. On the hull, sometimes the young worker gets too enthusiastic with the grinder and bites a bit deep, but most of outer layer seems to be just resin. It's a HOT day, even for Thailand, so we treat the team to cool drinks when the lady and her drinks cart/motorcycle comes by. Refreshment for 8 of us comes to just over $5. The language barrier is difficult and if we don't like how something is being done, we have to ask them to stop the work, find Golf, and get a translation. Jon had a shopping morning with Golf, heading off to Boat Lagoon where he picked up a new Tricolor LED sample from China, and a sweet little cockpit table hinge for a mere $2! Sue walked, stopping for fresh croissants at Wine Connection which just happens to be on the way! 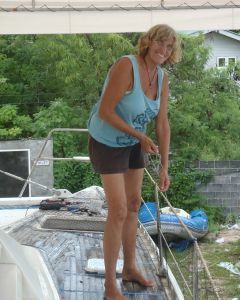 On board, Sue dove into the bilges to get rid of the last of the water from leaking emergency hatches. We plan to remove these hatches during the refit, recondition them, but then fill the holes with a sheet of polycarbonate. We'll keep the hatches in case a future owner wants them, as they're quite expensive. Meng removed the tramp sliders at the bow, and took off the deteriorated lattice that the chain runs on. Then he attacked the hardware from the port side steps: hatch hardware, handles and emergency tiller fitting. 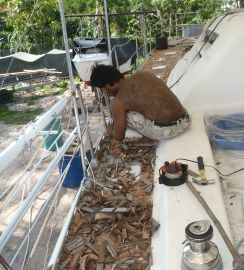 We still have 4 guys on teak removal. We bagged up all ropes and lines in the old sail bag, even throwing some in the "Free, Take It" pile. That should lighten Ocelot by another 40 pounds. Jon removed the windlass so the teak work could continue on the bow. More bottom paint was ground off the starboard transom. 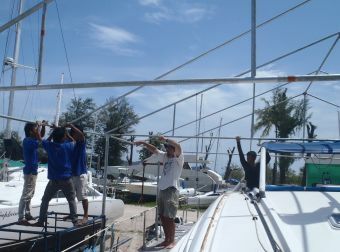 We pulled off the bimini today and found more of the Chennai coal dust that was lurking in the space between the layers. YUCK! Makes us consider the possibility of having a hard bimini made. What better time than now, with everything stripped off? The bimini was made of welded plastic in Richards Bay, South Africa 3 years ago, and maybe has one more year of life. Good news on the electricity front: even with the white tent peaked 6' (2m) over our solar panels, they're still getting some light, and each morning we are down only a nominal 10 amp‑hours or so. On a sunny day we get to almost full! The Coffee Lady on her motorbike and side cart has become our 3pm friend! Tall cups filled with ice, brewed coffee and sweetened condensed milk, all for 65¢. YUM! Started removing the mast steps by drilling out the expensive monel rivets. This was a difficult process that ended up breaking 2 of our drill bits. Dave from Precision Rigging stopped by to talk about rigging wire. He can get the wire we need, but right now he's got a load sitting in a ship off Bangkok that's unable to unload because of all the flooding in Bangkok. He suggested talking to NavTec about our rod rigging, as it's not something he can really deal with. 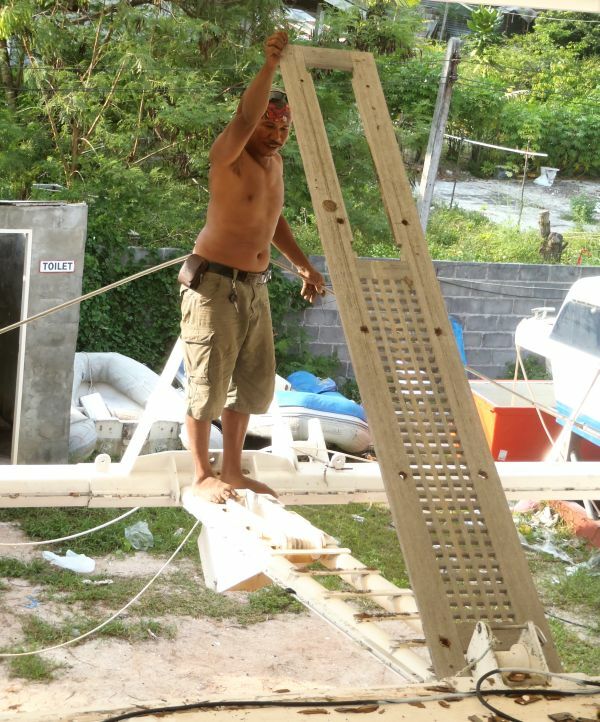 There are no machines in all of SE Asia that can form the head on rod rigging. 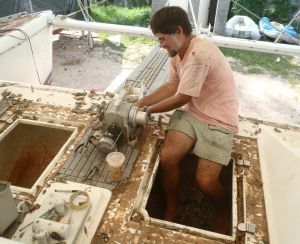 Meng and his guys finished removing the teak from the decks and started removing the teak from the engine hatches and sugar‑scoops. Meng also removed the cockpit table and started removing the hardware from the cockpit hatches. This spurred us to pack up all our gear in the cockpit lockers and store it at Golf's workshop. I think Golf's surprised at how much stuff we have, as his workshop is getting full. A bit of paint was scrapped off the bottom, but that job has slowed considerably. 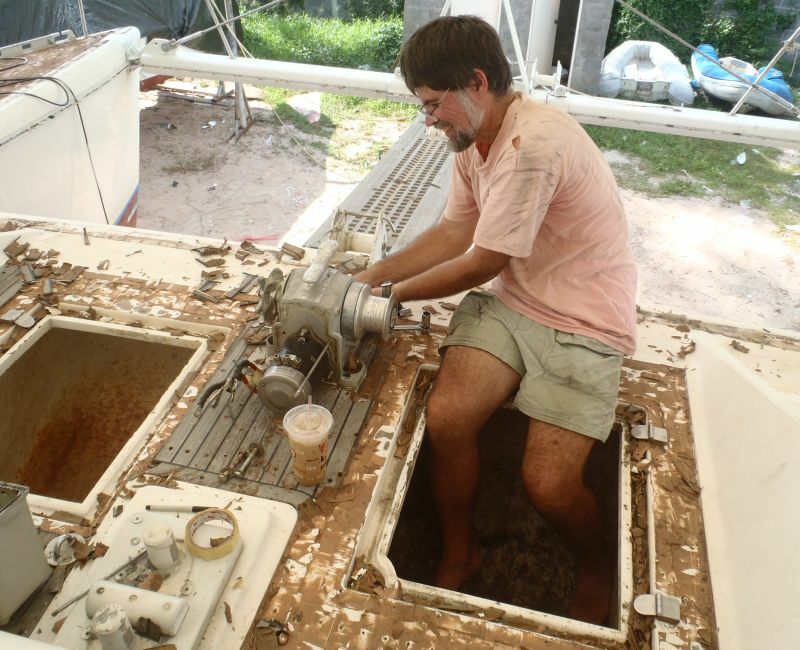 One guy ground back the paint where we want to extend the starboard sugar‑scoop, but he seems to work very slowly. Drilled out the rivets and removed the last mast step. This one needed the Dremmel and a specially made punch. Everywhere the mast has rivets it also has corrosion and bubbling paint. Our plan is to tap threads into the mast and replace all of the rivets with stainless steel bolts coated in an anti‑corrosive. This should be more secure and should allow us to replace problem bolts easily. Sue took pictures of the running lights and the steaming light on the mast, as both have crazed plastic and should be replaced. 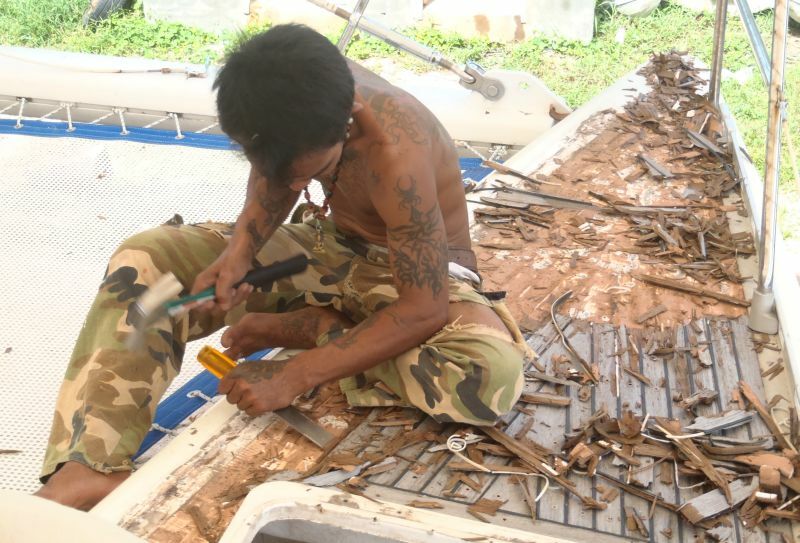 Meng and his guys finished removing the teak from the decks and the sugar‑scoops, and started on the cockpit. We hadn't really decided if we needed to replace the cockpit teak, but I guess we need to now. All the hardware was removed from the cockpit hatches and the whole helm seat and the swim ladders were removed as well. The cockpit looks very big without the seat or table. We lowered our big dinghy, Tomcat. 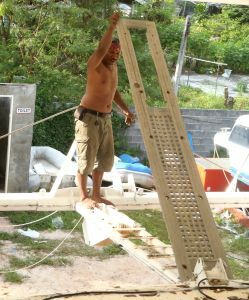 The davit ropes weren't long enough to reach all the way to the ground so it had to be lowered in sections. On the way down we also removed the life‑raft and the last of the fuel jugs from our storage area behind the cockpit. Four fuel jugs were full, which surprised us a bit as we thought they were all empty. When Tomcat was just above the ground we put the outboard in a water-filled plastic tub and then ran it with the fuel hose off until it used up all the fuel in the carburetor. This should help preserve it while it's not being used. 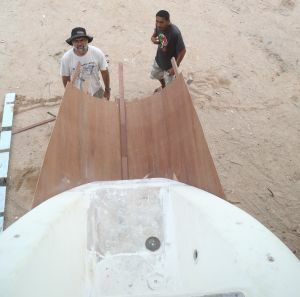 The biggest event was starting to create a frame for extending the sterns of the boat. As she's designed now, when loaded down, we have back flows of water which create vacuums that actually slow us down. If we can build an extension back far enough to get the transoms (sterns) out of the water, we'll have much better water flow, and better speed. Most modern cats have longer stern platforms than we do -- so obviously someone has put a lot of thought into the advantages. Getting the shape right, and the length right is the trick. Golf has done this before, but every boat is a bit different. Meng, Golf and Jon mocked up a possible frame this afternoon, but it now appears to be too short, as it may not end with the boat out of the water. "Monday, Monday!" they all agreed! Saturday is the end of the work week, and once a month Golf takes all 12‑14 of his workers into Phuket Town to a restaurant for dinner. Happy workers are good workers, so we decided to throw a smaller weekly party on the other Saturdays. We bought cans of Coke and beer, broke out the chips and spicy Malaysia peanuts and let the guys enjoy a bit of relaxing time once they knocked off work. Golf's beautiful wife, Mai was there too, with whom we share the language of ‑ smiles. Arrived at the yard after 10, to find 5 guys relaxing under Ocelot. It was threatening to rain, so we didn't start any outdoor projects. Instead, we got re-acquainted with a Canadian/Thai couple, Bill and Ju on Lighten Up. It's a 42' cat turned into 46' that they built in Malaysia 12 years ago. Bill seems to have some really interesting ideas about the transom extensions. They extended theirs, greatly increasing their comfort and speed, so we'll be talking with him quite a bit more! The heavens opened about noon, no work was being done, so we walked back to the apartment in the rain. Good thing we had saved out 2 umbrellas from the mad packing up!